The short of SearchBiblio.com is that it was established in October, 2000 under the name of biblio.com. In October of 2001, the site was moved from biblio.com to SearchBiblio.com, in order to free up the biblio.com address for other plans we have underway. The essential idea was that we could provide a fast and clean alternative to the major engines (our average search weighs in at under 10 seconds). SearchBiblio.com is a service which is run by biblio.com, Inc, of which I am presently president, programmer and janitor. Essentially it is a “one-man” operation, except for those rare times when I may need to bring in an independent contractor to pitch in. The number of sites we search, and the list have been subjected to some change, but at last count, we are searching 13 sites (Half.com, abebooks.com, Alibris, Powells.com, Amazon.com, ElephantBooks, Books-A-Million, BookCloseOuts.com, Bookavenue.com, Antiqbook, ILAB-LILA, Barnes & Noble.com, and Library Book Sales). Currently, our traffic is modest, with about 13,000 visitors a month (a number which I’d like to see grow, naturally). I personally have a background in English literature (almost anything written from 17th century to present, I am currently on a magical-realism kick with some Garcia Marquez and Fred Chappell, with some 13th century Mediterranean history on the side. I had several years as a bookseller (online and brick-and-mortar), and several years as a database and technology consultant for libraries, newspapers, museums, and universities, as well as other businesses. Currently, I work for Gannett Co., Inc., as the online production manager of its Asheville, NC paper (the Asheville Citizen-Times), and live in nearby Waynesville. I am married (Tracy Paige) with two daughters, aged one (Katherine) and three (Sophia). 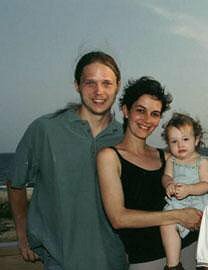 Attached is one of the few photos approved by my wife – of Tracy, Sophia, and myself (c. 2000).